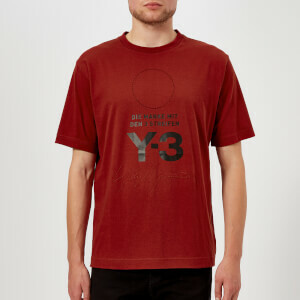 Men's short sleeve T-shirt from Y-3. Designed in collaboration with adidas and Japanese fashion designer, Yohji Yamamoto, the tee is crafted from lightweight cotton with a double-layered construction, and cuts a slim fit. Featuring a ribbed crew neck, short sleeves and Y-3 logo print with Sashiko-stitched circle and signature on the chest. Finished with back neck tape and side slits at the hem.